Almost four years ago we were delighted to be at the opening of the Salsbury Garden Book House conceived and constructed by our friends Penny Street and Steven Holmes, two of the most active and intelligent neighbourhood activists. Since then, the community library and resting space has thrived, lovingly maintained. Now it is the subject of an excellent feature article this week in the Tyee. Well worth the read. In Japan, they designate a select number of senior craftspeople and artisans as Living National Treasures (人間国宝 Ningen Kokuhō.) Those so honoured are treated with great deference and this indicates the respect that they have earned in their lifetimes in their particular fields. 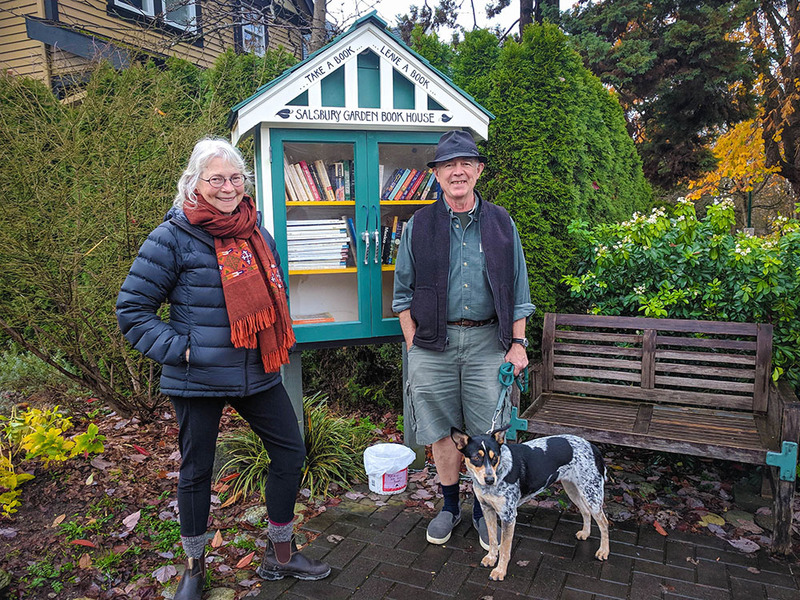 I have no desire to speak for the rest of Canada, but I do want to suggest that historian Bruce Macdonald be considered and honoured as one of Grandview’s Living Treasures. 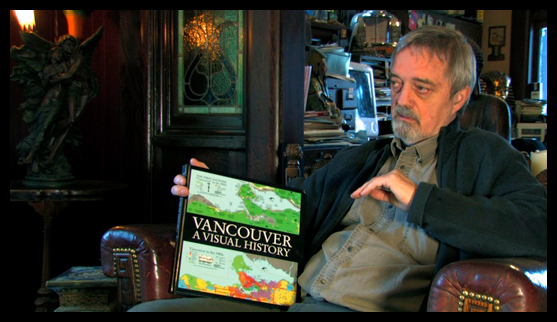 Bruce is perhaps best known for authoring the innovative “Vancouver: A Visual History” which told our story in a series of highly detailed and informative maps of each decade. Filled with useful visuals and careful text, this is one of the primary sources of Vancouver history. But he has done so much more. He has written extensively on the History of Grandview, Mount Pleasant, and Kitsilano. He has composed innumerable numbers of the Vancouver Heritage Plaques that adorn our city. He has worked with First Nations on ideas for a Salish Sea celebration. He was a founding member and is a leading light in the Grandview Heritage Group. He is currently working on a series of video interviews with our neighbourhoods seniors to ensure that their stories are not lost, and he is actively involved in the Our Community, Our Plan movement. Bruce is a fine guy and I am honoured to call him my friend. Happy birthday! Yesterday afternoon we were privileged to attend a celebration of the life of Patricia Salmond, late owner of the “Urban Empire” store and well-known and well-loved Drive diva. There was a very good turnout of family, friends, and Drive characters to say their farewells. Thanks to everyone who helped arrange this lovely and loving event. On the negative side, it was sad to hear that the owner of the building in which “Urban Empire” flourished has essentially locked out Ms. Salmond’s daughters and they have had to abandon the stock of zany goods still in the store. Shame. It is hard to imagine a more exciting time in Grandview’s history, than the period from 1900 to 1912 when the entire area was transformed from a quiet cedar forest on the edge of a wild ocean to a thriving suburb with streetcars and thousands of people. But it didn’t happen by itself. It happened because some people were willing to put their money down and with a mix of sweat equity and cheap but good labour, they raised houses. As some of you will already know, I have been fascinated for some time by one particular builder of houses — Mr James Edward Guinet — who built more than fifty fine houses in Grandview between 1906 and 1912, many of which remain to give us pleasure today. On Thursday, tomorrow, I will be giving an illustrated talk on James Guinet and his work in Grandview at the Grandview Heritage Group meeting at Britannia Boardroom at 7:00pm. Do come and join the conversation! Many of you will recall the shock and sadness throughout the neighbourhood when we learned earlier this year that Patricia Salmond of Urban Empire had died. I am so happy to be able to report that there will a celebration of her life which will be held on 24th May, from 2:30pm to 4:30pm, upstairs at the Canucks Room, Eastside Family Place, the nearest building to the playground in Grandview Park. I have already reported on the sudden and sad death of Patricia Salmond who ran the Urban Empire kitsch store. Now there is a lovely article in the Courier about her and how her daughters are dealing with their loss. In the interview, the sisters confirmed there will be a public memorial, probably in April. Patricia Salmond, the witty and engaging woman who operated Urban Empire on Commercial Drive since the early 1990s, has died. This is a terrible sadness for her family, of course, but also for all of us who were happy to pop into the shop and chat with her as we bought the odd range of doodads that the store specialized in. You are currently browsing the archives for the Individuals category.